We invent new words all the time and we’ve made several new words by putting ‘e’ in front of them. I wonder if the original meaning of ‘e’ has now been forgotten. We usually hyphenate these words when they are new. Some hyphens drop off over time. You seldom see email with a hyphen these days. And elearning is now used more widely. Sometimes the word after the ‘e’ is capitalised with brand names. 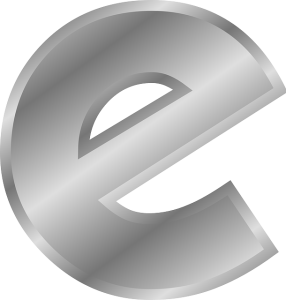 The e is usually lower case, but some people make it a capital at the beginning of a sentence or in a title. E-trade is on the rise.